The Hermitage Comforter has been discontinued. 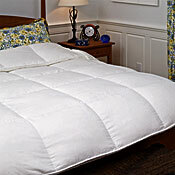 Lofty goose down comforter, beautifully constructed with all natural lyocell tick shell. Luxurious Hermitage comforters are silky soft and warm. 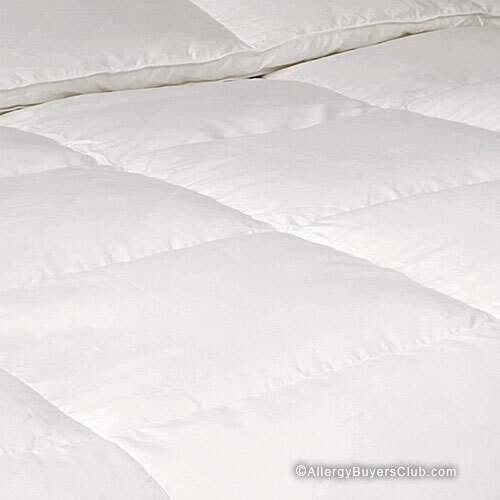 There is no equal to the fluffy loft and weightless warmth offered by the Hermitage comforter. Filled with 95% large cluster, hand selected, Siberian white goose down with a 800+ fill power, the Hermitage comforter is beautifully constructed with a 15' baffle box design and 2' outer gusset to support the comforters exceptional loft. As if that’s not enough, this comforter is covered in a down-proof, 100% biodegradable, all natural Lyocell tick shell that has the feel of silk charmeuse. Please Note: Siberian White Goose Down is a trade name used to represent high quality goose down that is known for its extreme warmth. Siberian White Goose Down does not mean that the goose down is from Siberia. Siberia’s climate is far too severe to farm geese in. The majority of goose down originates from China, and much smaller quantities originate from Europe, United States and Canada. Features: The Lyocell covering on the Hermitage model is lightweight and silky soft to the touch. Hermitage bedding is a natural, eco-friendly comforter with 15” baffled box construction. This is a great summer blanket for colder climates. Comforter is 100% biodegradable. Warranty: 5 year warranty against manufacturer defect. Please Note: Custom orders are not returnable unless covered under the warranty. Availability: This item is custom made and usually ships in 3-4 business days.